Nephi’s record on the small plates includes seven distinct scenes in which Nephi depicts the anger of his brethren against him. Each of these scenes includes language that recalls Genesis 37:5-10, 20, the biblical scene in which Joseph’s brothers “hate him yet the more [wayyôsipû ôd] for his dreams and for his words” because they fear that he intends to “reign” and to “have dominion” or rule over them (Genesis 37:8). Later, they plot to kill him (Genesis 37:20). Two of these “anger” scenes culminate in Nephi’s brothers’ bowing down before him in the same way that Joseph’s brothers bowed down in obeisance before him. Nephi permutes the expression wayyôsipû ôd in terms of his brothers’ “continuing” and “increasing” anger, which eventually ripens into a hatred that permanently divides the family. 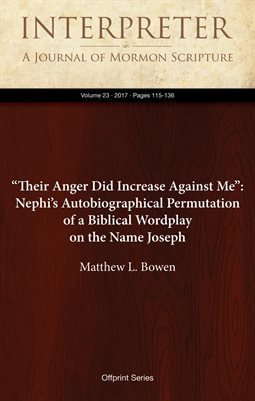 Nephi uses language that represents other yasap/yôsîp + verbal-complement constructions in these “anger” scenes, usage that recalls the name Joseph in such a way as to link Nephi with his ancestor.